Climate race: Will Elephant catch up with Dragon? On October 2, India submitted its much awaited Intended Nationally Determined Contribution (INDC) to fight climate change. The 38 page document that recalls India's ancient culture of vegetarianism and planet sustaining principles enshrined in its epics and sacred scriptures, pledges to reduce its gross domestic product (GDP) emission intensity by around 33-35 percent by 2030. The document also makes two big promises - to generate 40 percent electricity from non-fossil based energy sources and to enhance tree and forest cover to absorb carbon sink to the tune of 2.5 to 3 billion tonnes by 2030. Overall, India has come out with an ambitious pledge that relies heavily on energy efficiency, adaptation, technology-sharing and capacity-building efforts to fight climate threatening emissions. China on the other hand unveiled its INDC way back in June. In a major departure to its stand during Copenhagen years, the country has pledged to bring down its carbon dioxide intensity to an astonishing 60-65 percent below 2005 levels and expanding forest carbon stock volume to the tune of 4.5 billion cubic meters (from 2005 levels) by 2030. The most promising climate action commitment however is 20 percent increase of non-fossil fuels share in the total energy mix by 2030. To change the energy mix, in statistical term China would have to deploy some 800 to 1000 GW in non-fossil capacity. In short, China has turned the tables on climate battle with lofty goals and big ticket initiatives. How India and China are paired in terms of their climate change pledges and strategies? Can both countries be really compared on climate goals? This is because two countries stand apart with regard to energy generation, consumption profile and levels of emission. 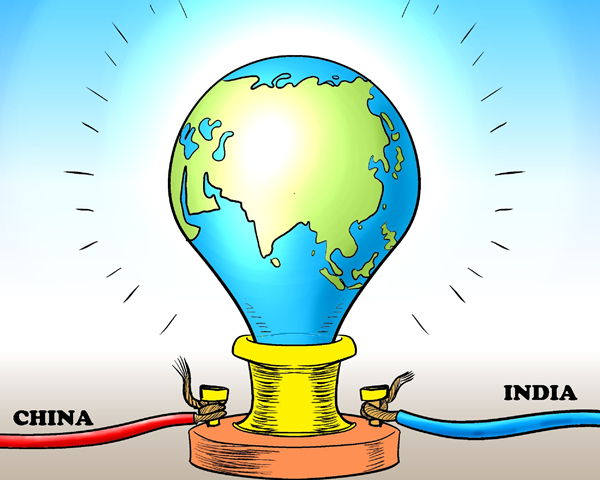 While China's installed energy capacity is 1260 GW, India has managed to generate just about 271 GW. With regard to consumption, while nearly every household in China has access to electricity, a mammoth 45 percent of India's rural household are yet to access electricity. This logically splits two countries in terms of carbon contribution. While China contributes to 26 percent of global emissions, India's share is anything around 6 percent. On planet threatening climate battle, India and China have plenty to cooperate and collaborate, from mitigation strategies, finance, climate technology to funding of new start ups.